Mice lacking ITK were shown to not be susceptible to asthma. ^ Gibson S, Leung B, Squire JA, Hill M, Arima N, Goss P, Hogg D, Mills GB (September 1993). "Identification, cloning, and characterization of a novel human T-cell-specific tyrosine kinase located at the hematopoietin complex on chromosome 5q". Blood. 82 (5): 1561–72. PMID 8364206. ^ a b Gomez-Rodriguez J, Kraus ZJ, Schwartzberg PL (March 2011). "Tec family kinases Itk and Rlk/Txk in T lymphocytes: cross-regulation of cytokine production and T-cell fates". FEBS. 278 (12): 1980–1989. doi:10.1111/j.1742-4658.2011.08072.x. PMC 3117960. PMID 21362139. ^ Kosaka Y, Felices M, Berg LJ (October 2006). "Itk and Th2 responses: action but no reaction". Trends Immunol. 27 (10): 453–60. doi:10.1016/j.it.2006.08.006. PMID 16931156. ^ "Entrez Gene: ITK IL2-inducible T-cell kinase". ^ Mueller, Cynthia; August, Avery (2003-05-15). "Attenuation of immunological symptoms of allergic asthma in mice lacking the tyrosine kinase ITK". Journal of Immunology. 170 (10): 5056–5063. doi:10.4049/jimmunol.170.10.5056. ISSN 0022-1767. PMID 12734350. ^ Hawkins J, Marcy A (July 2001). "Characterization of Itk tyrosine kinase: contribution of noncatalytic domains to enzymatic activity". Protein Expr. Purif. 22 (2): 211–9. doi:10.1006/prep.2001.1447. PMID 11437596. ^ a b c Bunnell SC, Diehn M, Yaffe MB, Findell PR, Cantley LC, Berg LJ (2000). "Biochemical interactions integrating Itk with the T cell receptor-initiated signaling cascade". J. Biol. Chem. 275 (3): 2219–30. doi:10.1074/jbc.275.3.2219. PMID 10636929. ^ a b c Bunnell SC, Henry PA, Kolluri R, Kirchhausen T, Rickles RJ, Berg LJ (1996). "Identification of Itk/Tsk Src homology 3 domain ligands". J. Biol. Chem. 271 (41): 25646–56. doi:10.1074/jbc.271.41.25646. PMID 8810341. ^ a b Andreotti AH, Bunnell SC, Feng S, Berg LJ, Schreiber SL (1997). "Regulatory intramolecular association in a tyrosine kinase of the Tec family". Nature. 385 (6611): 93–7. doi:10.1038/385093a0. PMID 8985255. ^ a b Hao S, August A (2002). 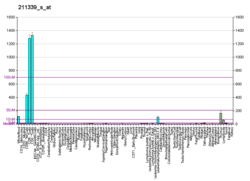 "The proline rich region of the Tec homology domain of ITK regulates its activity". FEBS Lett. 525 (1–3): 53–8. doi:10.1016/S0014-5793(02)03066-1. PMID 12163161. ^ Perez-Villar JJ, O'Day K, Hewgill DH, Nadler SG, Kanner SB (2001). "Nuclear localization of the tyrosine kinase Itk and interaction of its SH3 domain with karyopherin alpha (Rch1alpha)". Int. Immunol. 13 (10): 1265–74. doi:10.1093/intimm/13.10.1265. PMID 11581171. ^ Shan X, Wange RL (1999). "Itk/Emt/Tsk activation in response to CD3 cross-linking in Jurkat T cells requires ZAP-70 and Lat and is independent of membrane recruitment". J. Biol. Chem. 274 (41): 29323–30. doi:10.1074/jbc.274.41.29323. PMID 10506192. ^ Perez-Villar JJ, Whitney GS, Sitnick MT, Dunn RJ, Venkatesan S, O'Day K, Schieven GL, Lin TA, Kanner SB (2002). "Phosphorylation of the linker for activation of T-cells by Itk promotes recruitment of Vav". Biochemistry. 41 (34): 10732–40. doi:10.1021/bi025554o. PMID 12186560. ^ Shim EK, Moon CS, Lee GY, Ha YJ, Chae SK, Lee JR (2004). "Association of the Src homology 2 domain-containing leukocyte phosphoprotein of 76 kD (SLP-76) with the p85 subunit of phosphoinositide 3-kinase". FEBS Lett. 575 (1–3): 35–40. doi:10.1016/j.febslet.2004.07.090. PMID 15388330. ^ Perez-Villar JJ, Kanner SB (1999). "Regulated association between the tyrosine kinase Emt/Itk/Tsk and phospholipase-C gamma 1 in human T lymphocytes". J. Immunol. 163 (12): 6435–41. PMID 10586033. ^ Brazin KN, Mallis RJ, Fulton DB, Andreotti AH (2002). "Regulation of the tyrosine kinase Itk by the peptidyl-prolyl isomerase cyclophilin A". Proc. Natl. Acad. Sci. U.S.A. 99 (4): 1899–904. doi:10.1073/pnas.042529199. PMC 122291. PMID 11830645. ^ Cory GO, MacCarthy-Morrogh L, Banin S, Gout I, Brickell PM, Levinsky RJ, Kinnon C, Lovering RC (1996). "Evidence that the Wiskott-Aldrich syndrome protein may be involved in lymphoid cell signaling pathways". J. Immunol. 157 (9): 3791–5. PMID 8892607. Kosaka Y, Felices M, Berg LJ (2006). "Itk and Th2 responses: action but no reaction". Trends Immunol. 27 (10): 453–60. doi:10.1016/j.it.2006.08.006. PMID 16931156. Janis EM, Siliciano JD, Isaac DD, et al. (1995). "Mapping of the gene for the tyrosine kinase Itk to a region of conserved synteny between mouse chromosome 11 and human chromosome 5q". Genomics. 23 (1): 269–71. doi:10.1006/geno.1994.1492. PMID 7829087. Gibson S, Leung B, Squire JA, et al. (1993). "Identification, cloning, and characterization of a novel human T-cell-specific tyrosine kinase located at the hematopoietin complex on chromosome 5q". Blood. 82 (5): 1561–72. PMID 8364206. Tanaka N, Asao H, Ohtani K, et al. (1993). "A novel human tyrosine kinase gene inducible in T cells by interleukin 2". FEBS Lett. 324 (1): 1–5. doi:10.1016/0014-5793(93)81520-A. PMID 8504851. Bunnell SC, Henry PA, Kolluri R, et al. (1996). "Identification of Itk/Tsk Src homology 3 domain ligands". J. Biol. Chem. 271 (41): 25646–56. doi:10.1074/jbc.271.41.25646. PMID 8810341. Andreotti AH, Bunnell SC, Feng S, et al. (1997). "Regulatory intramolecular association in a tyrosine kinase of the Tec family". Nature. 385 (6611): 93–7. doi:10.1038/385093a0. PMID 8985255. Heyeck SD, Wilcox HM, Bunnell SC, Berg LJ (1997). "Lck phosphorylates the activation loop tyrosine of the Itk kinase domain and activates Itk kinase activity". J. Biol. Chem. 272 (40): 25401–8. doi:10.1074/jbc.272.40.25401. PMID 9312162. Kaukonen J, Savolainen ER, Palotie A (1999). "Human Emt tyrosine kinase is specifically expressed both in mature T-lymphocytes and T-cell associated hematopoietic malignancies". Leuk. Lymphoma. 32 (5–6): 513–22. doi:10.3109/10428199909058409. PMID 10048424. Shan X, Wange RL (1999). "Itk/Emt/Tsk activation in response to CD3 cross-linking in Jurkat T cells requires ZAP-70 and Lat and is independent of membrane recruitment". J. Biol. Chem. 274 (41): 29323–30. doi:10.1074/jbc.274.41.29323. PMID 10506192. Su YW, Zhang Y, Schweikert J, et al. (1999). "Interaction of SLP adaptors with the SH2 domain of Tec family kinases". Eur. J. Immunol. 29 (11): 3702–11. doi:10.1002/(SICI)1521-4141(199911)29:11<3702::AID-IMMU3702>3.0.CO;2-R. PMID 10556826. Perez-Villar JJ, Kanner SB (2000). "Regulated association between the tyrosine kinase Emt/Itk/Tsk and phospholipase-C gamma 1 in human T lymphocytes". J. Immunol. 163 (12): 6435–41. PMID 10586033. Bunnell SC, Diehn M, Yaffe MB, et al. (2000). "Biochemical interactions integrating Itk with the T cell receptor-initiated signaling cascade". J. Biol. Chem. 275 (3): 2219–30. doi:10.1074/jbc.275.3.2219. PMID 10636929. Shan X, Czar MJ, Bunnell SC, et al. (2000). "Deficiency of PTEN in Jurkat T cells causes constitutive localization of Itk to the plasma membrane and hyperresponsiveness to CD3 stimulation". Mol. Cell. Biol. 20 (18): 6945–57. doi:10.1128/MCB.20.18.6945-6957.2000. PMC 88770. PMID 10958690. Hawkins J, Marcy A (2001). "Characterization of Itk tyrosine kinase: contribution of noncatalytic domains to enzymatic activity". Protein Expr. Purif. 22 (2): 211–9. doi:10.1006/prep.2001.1447. PMID 11437596. This page was last edited on 20 March 2019, at 21:55 (UTC).